Well, I'm not quite sure how I feel about this one. It's very well done, zero problems with "production value, acting, writing," etc. And the story is sufficiently compelling and well executed. And I guess, maybe, somehow, perhaps absolutely, Snowden is a patriot. But a lot of the time, I just felt kinda queasy, like he's a slimy, treasonous traitor who risked American lives. And Oliver Stone, predictably, glorifies him. The fawning and adulation made me cringe more than once. 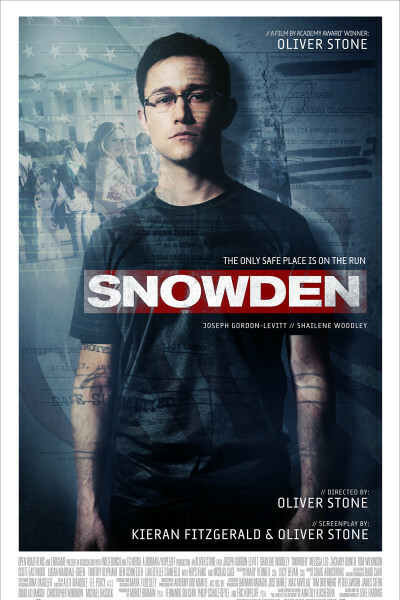 It's really hard to get a bead on Snowden, and I go back and forth in my mind. On the one hand, yep, "dragnetting the world" [his words] is horrible, wrong, illegal, "undemocratic." And on the other hand, well, these are dangerous times and America can't let Her enemies (real, eventual, or perceived) get the high end of the stick. God only knows what Russia, Iran, China do in the name of national security. Someone is hacking the DNC, Colin Powell, threatening to tinker with elections, and trolling our every move. Zero doubt. For now, I'll simply say that Snowden has lived by his convictions and in exile for 3 years thus far. It shall be interesting to see whether the United States ever extends him amnesty, which he has requested, or if he'll serve out his remaining days in a bubble, like Julian Assange. There have been some interesting developments about both men this very week. Whether history views them favorably or unfavorably is anyone's guess, but for now they are polarizing crusaders with a cause, treated in many ways like lepers, having created casualties on every side and with no clear path forward toward redemption or the inevitability of incarceration. Frozen, stuck, trapped in bitter political amber. I wonder what Trump would do with Snowden, having said prior he'd have him executed? Probably nothing, just posture. "May you live in interesting times." Yep, box checked.